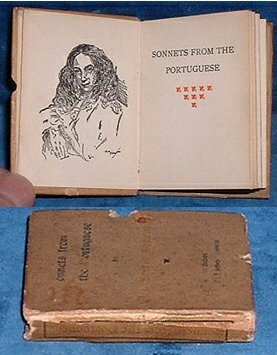 Title: SONNETS FROM THE PORTUGUESE with a note. Description: London, T. Fisher Unwin undated 1906) but no date given Frontis portrait + plate of Italian cemetery designed by Lord Leighton for E.B.Browning in Florence. . MINIATURE 2.5 x 2inches (64x50mm) cream boards (lacks ties/some fading of the print to covers & spine/5x2mm bite out of fore-edge/tips & spine worn/bumped) Titlepage printed in red and black +104pp many pages in red and black. Miniature noted by Bondy (p122) as "attractive editions". (See also the deluxe leather copy with the Rosen Venice imprint not noted by Bondy, our catalogue V68854).